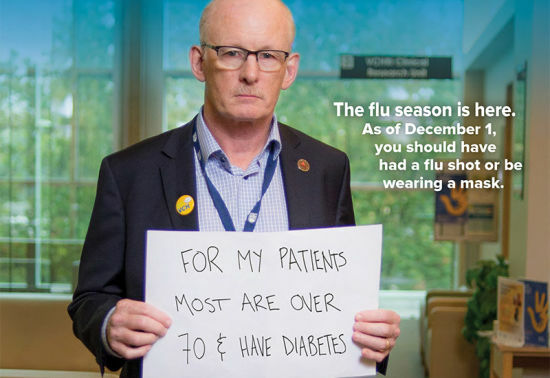 The latest news and resources for health professionals to help fight the flu. With BC Cancer guideline on reverse. Frequently asked questions from the public for the 2018-2019 campaign. VCH influenza education sessions have now been posted on LearningHub. 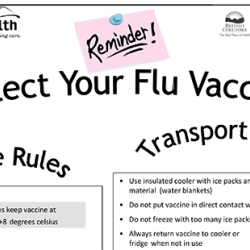 Bring over flu resources from VCH? Pharmacists immunization resources on VCH. The influenza vaccine is safe and well-tolerated. Immunization has been shown to reduce the number of physician visits, hospitalizations and deaths in high-risk adults. It cannot cause influenza illness. The inactivated vaccines do not contain the live virus. The viruses in live attenuated influenza vaccines are weakened (can cause upper respiratory symptoms in ~5% of people). The body’s immune response from vaccination diminishes within a year, and influenza viruses change often. 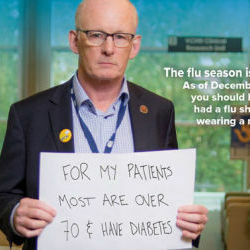 For more information for the public, including who can get the free shot and where, see Get Flu Protection. You can also download this FAQ as a pdf. What is in the influenza vaccine this year? When will the flu shot be available? Influenza vaccines are being distributed to physicians and pharmacists now. Long-term care facilities and Workplace Health have already received vaccine. Public health mass clinics will start in mid-October to early November 2018. At a VCH Public Health clinic. Please see details on each clinic as some are on a drop-in basis and others are by appointment. I already received a trivalent influenza vaccine this season. Should I get a dose of the quadrivalent influenza vaccine as well? No. More than one dose of influenza vaccine in a season is not recommended, except for those children 6 months to 8 years receiving their influenza vaccine for the first time. If I get the flu vaccine every year, will it continue to protect me? Yes. Many studies have shown that people who receive the flu shot are better protected against seasonal influenza than those who are not vaccinated. Among those who are vaccinated each year, the amount of protection may be reduced over time; however, the reasons for this require better understanding. Since these studies show that vaccinated people are always better off than unvaccinated people regardless of prior history of immunization, therefore people are recommended to continue getting their annual influenza vaccine. Should I be concerned about the effectiveness of FluMist®? No. The National Advisory Committee on Immunization (NACI) continues to recommend this vaccine for children 2-17 years of age and continuously reviews data on performance of Flumist®. Why is Fluzone HD® (High Dose) not publicly funded for seniors? In order to simplify number of vaccine products offered, Fluzone HD® was not purchased by the province and is not be a publicly funded vaccine this Fall 2018. Fluzone HD® is a private pay option for seniors that is recommended by NACI and can be purchased without prescription at select pharmacies. Fluviral® or Influvac® are the publicly funded trivalent influenza vaccines that should be offered to seniors. What is the difference between Fluzone® Quadrivalent and Fluzone® High-Dose (HD) vaccines? Fluzone® Quadrivalent is a publicly funded flu vaccine indicated for children 6 months to 17 years of age to protect against four strains of the flu; two A strains and two B strains. Fluzone® HD is a trivalent inactivated influenza vaccine that contains four times the amount of antigen compared to regular flu vaccines. The additional antigen is intended to create a stronger immune response in the person getting the vaccine. In Canada, this vaccine is approved for adults 65 years of age and older and can be purchased from a pharmacy. For more information on Fluzone® HD, please see the BCCDC - Q and A. Can seniors get the ‘double’ dose of Fluzone® Quadrivalent as Fluzone® HD is not publicly funded? No. Double dosing influenza vaccine for seniors is not recommended as there are a number of differences between the two vaccine products and the pediatric vaccine is intended for children 6 months-17 years of age. Does Influvac vaccine need to be brought to room temperature before use/administration as per product package messaging? No. 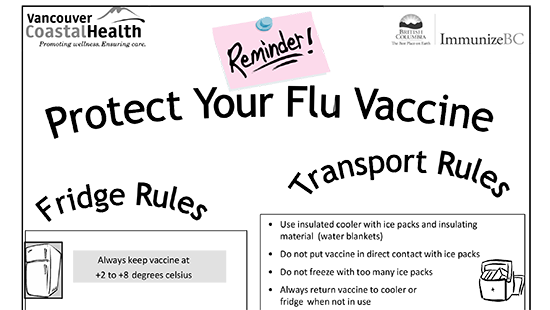 All vaccine providers are advised to follow existing VCH Cold Chain Management guidelines. There is no need to allow vaccine to reach room temperature prior to use. BCCDC advises that vaccine should be administered as soon as it is prepared. The risk of vaccine administration errors and cold chain breaks is increased if vaccine is left at room temperature for unspecified amounts of time.